An easy-to-use viewing and focusing aid which allows near and farsighted photographers to view the finder image accurately without wearing eyeglasses. Correction lens, +1.0 strength. 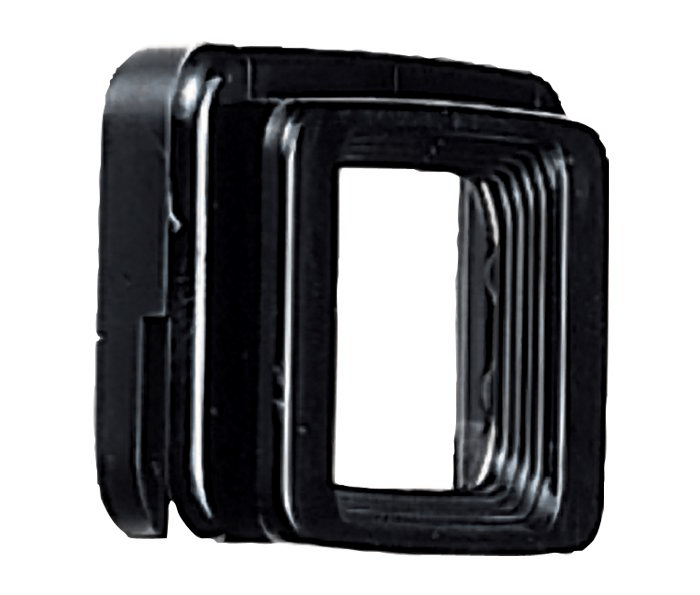 An easy-to-use viewing and focusing aid which allows near and farsighted photographers to view the finder image accurately without wearing eyeglasses. a neutral numeric diopter value. Standard eyepieces supplied with Nikon SLR cameras have no corrective value and are for dust protection only. Select eyepieces are supplied with a rubber coating designed to lessen scratching of a photographer’s eyeglasses. Nikon SLR cameras (without built-in adjustable eyepiece correction) have a base diopter value of minus one. This is why you won’t find an accessory Nikon eyepiece diopter valued at minus one. Minus one is considered the optimum starting point for the majority of SLR users with normal vision. The combination of the camera’s viewfinder components and a clear (standard) eyepiece form a virtual image of a subject on the camera’s focusing screen that is the approximate equivalent of a viewing distance of one meter. Each Nikon eyepiece diopter incorporates a numerical value, represented by a minus value (near-sighted) or a plus value (farsighted) number, enabling you to select the appropriate diopter for your vision and your camera model. The eyepiece’s diopter value is, when combined with the viewfinder’s minus one value, the end-result value. No combination of the camera’s base value of minus one and a given accessory diopter’s value is required to arrive at the final desired value. In other words, if you require a diopter of plus 3, simply add a plus 3 diopter to your camera. Neutral correction eyepieces do not replace the supplied standard eyepiece. The use of a neutral correction eyepiece will change the diopter value of the camera from minus one to zero. To determine which Nikon diopter value is best suited for you, visit your ophthalmologist, optometrist or dispensing optician. Ask them to determine your diopter from (your corrective prescription) when viewing an object at distance of approximately one meter. Base your selection on this diopter value. Some Nikon SLR Cameras have built-in adjustable eyepiece correction. Please check your instruction manual to see if additional threaded Nikon eyepiece diopters can be combined with your camera’s built-in diopter control. For cameras with built-in diopter control, use additional Nikon eyepiece diopters only if your vision dictates that optimum viewfinder sharpness cannot be achieved with the built-in diopter adjustment control. Select camera models will accept eyepieces from multiple eyepiece families.